(PhysOrg.com) -- Using NASA’s Spitzer Space Telescope, an international team of astronomers have found that at least 1 in 100 white dwarf stars show evidence of orbiting asteroids and rocky planets, suggesting these objects once hosted Solar Systems similar to our own. Using the infrared detectors on NASA's Spitzer Space Telescope, a team of researchers based in the U.K. and in the United States have placed new constraints on how often rocky planets like Earth may exist around stars other than our Sun. The team of researchers, including Jay Farihi, from the University of Leicester; and Michael Jura and Ben Zuckerman, both from UCLA, looked at the environments surrounding a number of "dead" stars known as a "white dwarfs". 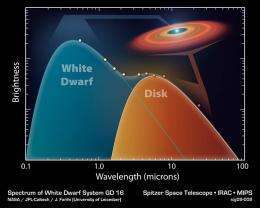 Using Spitzer's sensitive infrared eyes, they found that at least 1-3% of all white dwarf stars of a certain age are surrounded by dust and rocky debris. "The infrared glow from dust around these white dwarfs is a road sign that tells us there were — or are — unseen rocky planets in these systems," said Farihi. 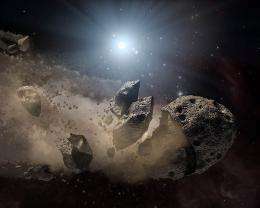 The team believes that the dust was produced when asteroids - the building blocks of rocky planets - surrounding the star were pushed and pulled apart by the force of the star's gravity. The dust then formed a glowing disk of orbiting, rocky material that Spitzer detected. Just how common are rocky bodies around white dwarfs? In a previous study by this team, a sample of eight white dwarfs were shown to have the dusty remnants of shredded asteroids. In this study Farihi and his team systematically searched around metal-rich white dwarfs and placed statistical constraints on the frequency of inferred rocky planets. "We now know of 14 white dwarfs circled by dusty debris. This suggests that at least 1-3% of main-sequence A and F stars — stars slightly hotter and larger than the Sun — have rocky planets, like Earth," said Farihi. For the rocky bodies to be destroyed by the gravitational effects of the white dwarf, they would have to be knocked out of their orbits, towards the star. Farihi and his team believe that, although in principle this kick could come from a terrestrial planet, a large gas giant planet like Jupiter would do the job much more efficiently. Therefore, the small percentage of white dwarfs that might possess rocky planets probably have larger, gas-giant-like planets as well. White dwarfs are the remnants of relatively low-mass stars that have passed through their red giant stage. Stars are composed mostly of hydrogen, and, during their lives, they burn more and more of the hydrogen, converting hydrogen into helium, until very little hydrogen is left. Then, the star begins to burn helium to create even heavier elements. When the supply of helium runs out, the star burns heavier and heavier elements, until it produces iron, which cannot be burned. At this point, the star's contraction — due to its gravity — and its expansion — due to the energy produced by its thermonuclear reactions — become unbalanced, and the outer layers of the star puff out. Over time, the layers blow out into space, leaving behind a small core, which, because of the extreme gravity, compresses until it is extraordinarily dense. This core is called a "white dwarf." A white dwarf may be the size of the Earth, but contain the same mass as the Sun. This star remnant is so dense, in fact, that one teaspoon of white dwarf material would weigh several tons. Over 90% of all stars — including our Sun — will end their lives as white dwarfs. According to Farihi and his team, studying white dwarf stars is a good way to study planetary systems outside of our own Solar System. First, a white dwarf star is relatively dim and small -so its heat won't outshine the heat emitted by giant planets or dust orbiting it. Second, white dwarf stars do not contain significant amounts of heavy elements, like metals, so if metals are detected in a white dwarf, one can assume that the white dwarf has been absorbing those elements from surrounding debris. This permits an indirect way of studying the composition of distant planets. This research paper was written by Jay Farihi, at the University of Leicester, UK; and Michael Jura and Ben Zuckerman, both at UCLA. Team member Professor Jay Farihi of the University of Leicester presents this discovery on Monday 20th April at the European Week of Astronomy and Space Science conference at the University of Hertfordshire. It is misleading for you to entitle an apparent 'artist's rendition' as an 'Image' from JPL !! An 'image' implies that an 'imaging device' was used, eg, a camera. Ascribing the 'image' to JPL further misleads the public, for JPL is a science-based organization, not a collective of artists. first they state that a white dwarf has preceeded through sucessive fusions arriving at iron..then state they have little heavy metal content???? "white dwarf material is not composed of atoms bound by chemical bonds, but rather consists of a plasma of unbound nuclei and electrons"